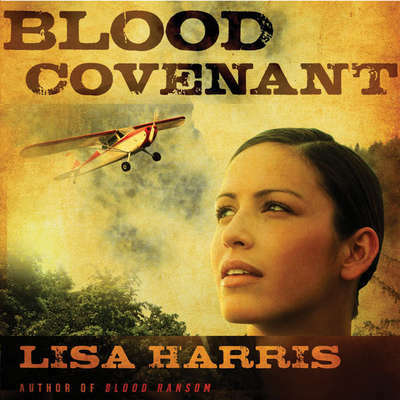 Blood Covenant - Audiobook | Listen Instantly! From the explosive first pages, Lisa Harris weaves a tale of heart-stopping suspense and adventure with her second book in the Mission Hope Series. When fighting erupts between government forces and renegade Ghost Soldiers deep within the Republic of Dhambizao, thousands are forced to leave their homes. Dr. Paige Ryan, who works with Volunteers of Hope International, is sent to lead a team to set up a refugee transit site—where the immediate needs for shelter, water, sanitation, and food are critical. Nick Gilbert, a bush pilot for Compassion Air, joins the team to help fly supplies in and out of the area. With the refugee camp already experiencing overcrowding, raids, and uprisings, a group of American mountain climbers is attacked by the Ghost Soldiers. Paige’s medical team responds immediately, rescuing survivors and taking them into the camp. When it’s discovered that one of the trekkers is carrying an infectious disease, the harrowing conditions of the camp are forgotten. In desperate need of vaccines and the Ghost Soldiers blocking the only road out until their demands for amnesty are met, it won’t be long before the disease is out of control … and there is nowhere to run. Download and start listening now!
" Second book in the series, only a slight overlap in characters. Different setting, different challenges. An enlightening, fictionalized look that makes me consider the real events of the world, considering what is happening in Libya right now. " " Author Lisa Harris lives in Mozambique and paints a picture of hope amidst the death and brutality in Africa. Even though this is a work of fiction, she writes of people hurting and exploited and needing a message of hope. "